NEW for 2017! This beautiful Grand Haven home is the perfect location for your vacation destination. Brucker Beach Bungalow is located just 100 yards from a public Lake Michigan beach access. Enjoy the spectacular views of the lake with your morning coffee from the deck. This vacation home is minutes away from all of your favorite "things to do!" Brucker Beach Bungalow sleeps 8 people in 3 bedrooms and is well appointed with decor from the homeowner’s travel abroad. The large master bedroom, located on the main level, has a king bed while the additional room off the master bedroom provides a twin trundle bed for an additional relaxation spot or sleeping area. The second bedroom has a queen bed and the third bedroom has 2 twin beds. The home opens up on the upper level to an expansive living room with a vaulted ceiling, dining area and great room with views of Lake Michigan. The upper level also features the kitchen and a 1/2 bathroom. The interior has been newly remodeled with French White Oak wood flooring and crisp white paint throughout. 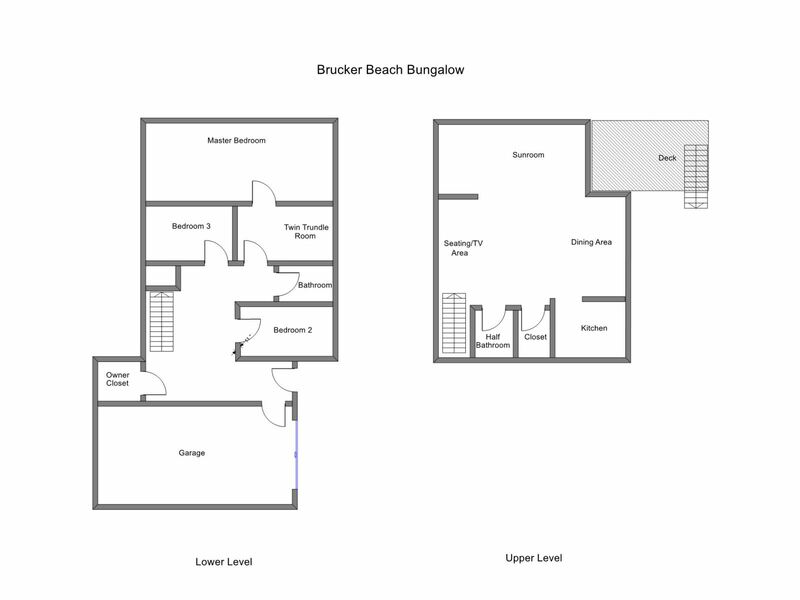 Note from Owner: "Welcome to Brucker Beach Bungalow! 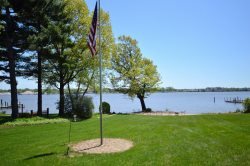 We were thrilled when this property so close to Lake Michigan went up for sale in 2016. Having grown up in Grand Haven it has always been a dream to be able to have a place of our own to to come back to that we can enjoy with friends, family and others as well. We spent many months planning and thinking about the renovation and all the design details and hope you enjoy all the special little touches. Grand Haven is a fabulous family friendly town with fun little restaurants, bars and plenty to do when it comes to water sports and enjoying the outdoors. Day trips both north and south of town along the lake also offer endless activities and beautiful sight-seeing. We hope you enjoy our lake view home and our special seaside town and all it has to offer." Marela was easy to talk to on phone while booking and asking questions. She stopped by with landscape services and was kind to us. I know we were the first rental and they still had a vision for updating the grounds around the home. Updated, clean, with Great Lake Michigan breezes through the amazing Windows in the living space and master bedroom. Extremely easy walk to the beach/water front. Enjoyed our stay and would definitely return.